The latest Toyota Corolla is receiving tons of praise from drivers and critics for its reliability, safety, and affordability. In the compact sedan class, there is no other like the Corolla. The new Hatchback XSE and XSE CVT. 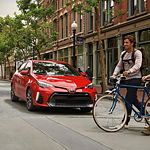 With a new, larger design, the exterior of the Corolla boasts a new sporty look with a redesigned headlamp and fog lamp, as well as an all-new grill. The remarkable safety features include the exterior sensors and cameras that have made driving this car incredibly safe. The Corolla Hatchback series makes a return with this latest redesign as well. The new car is designed for performance and fuel efficiency, achieving 168 horsepower. The modern, aerodynamic design of the Hatchback XSE is one of the reasons that it has become so popular, as well as its incredibly low price. Want to see all of the new Corolla models? Check out the Corolla at Toyota Of Plano.